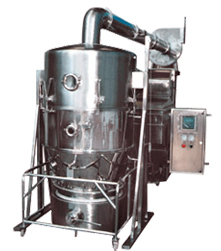 FLUID BED DRYER is designed to introduce the hot air stream at the base of the product container, which is filled with the material. Induced draught is created by means of blower and fresh air is sucked in to the unit. The fresh air is heated by means of electrical heaters or steam or thermic fluid heaters. This hot air stream expands the bed of material at certain velocity and create turbulence in the product. The phenomenon is known as fluidization and offer conditions, which are almost ideal for drying. Fluidization produces full agitation of solid particles and since hot air surrounds each particle, heat transfer is extremely high and uniform. The product is dried fast without appreciable loss of heat. Filter bags prevent particles escaping from the dryer. 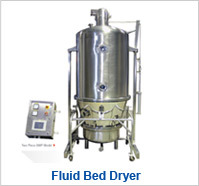 The Fluid Bed Dryer is not suitable for drying liquids or pasty materials. in liters Working capacity in kgs.